As PDP heads into the 2018 polls the much improved state of the economy compared to 2013 is the strongest suit that it is wearing. Not surprisingly, this is the biggest part of the manifesto running into 22 pages. The PDP promises to deliver an average growth rate of 10% in the next five years. It will review the Economic Development Policy to make it more relevant to emerging economic needs and challenges. It promises to establish 100 more medium and large industries in the next five years. PDP promises to create around 35,000 more jobs in CSI, hydropower, mining, medium and large industries, and trading sectors in the next five years. We shall work towards 20% increase in export volume of 22 identified products having export potential. PDP promises enhancing promotion of Consumer Protection activities. PDP will also promote Public Private Partnership (PPP) projects. PDP says it shall ensure all households in the country are electrified by 2023. PDP shall revise electricity rate for domestic consumers to reduce power rates. PDP shall strive to achieve a minimum power generation of 5,000MW by the end of 2022. PDP shall implement acceleration measures for timely completion of the hydropower projects under construction. This is essential in light of the fact that delays in projects would translate to revenue forgone. Timely completion would also ease pressure on external debt. PDP shall develop Bhutan as a knowledge center for hydropower development and related services both in the region and the world. It shall develop local capacities to design, develop, build and operate hydropower projects through Druk Green Power Corporation (DGPC) and Construction Development Corporation Limited (CDCL) as local expert institutions. It shall develop local human resource capacity in the hydropower sector to take up skilled works. This would create employment opportunities for local skilled workforce. PDP shall complete the Detailed Project Report (DPR) for all hydropower projects that are techno-economically feasible. PDP shall carry out timely and regular monitoring of critical glacial lakes and risk assessment. PDP shall ensure adequate supply of power to power intensive industries to boost the private sector and create employment. Special focus shall be given on renewable energy resources like solar, wind, biomass, small hydro and other emerging modern fuels as sources for energy generation. PDP shall undertake geological mapping of crucial mineral resources. It shall encourage value addition of our mineral resources by promoting industries that would use local mineral resources. PDP shall enhance export of raw minerals where either value addition is not possible or it does not offer economic advantage. PDP shall encourage the mining sector to create employment opportunities for Bhutanese. PDP shall increase annual export of mining products by Nu. 1.5 billion. The State Mining Corporation (SMC) will be strengthened to be a model mining company in the country and all proceeds from the SMC will go to the education ministry mainly to finance the central schools. PDP shall ensure environment friendly mining practices and upscale green mining technologies in the mining sector. It shall ensure that local communities are primary beneficiaries in the mining sector. It shall encourage community ownership of mines and develop modalities for local communities to own shares in mining companies. PDP shall ensure that mining companies adhere to their Corporate Social Responsibilities, which shall benefit communities impacted by mining activities. Bhutan shall strive to achieve 70% food self sufficiency across major food items in the next five years. PDP shall introduce Guaranteed Buy-back Scheme of agricultural produce to purchase farm produce and facilitate agriculture trade and business. Commercial farming will be promoted through farm mechanization and suitable agriculture technologies. Cultivation of all fallow lands in the country will be promoted. PDP shall maintain existing irrigation channels and construct 700 km of new irrigation channels to irrigate about 50,000 acres of land. 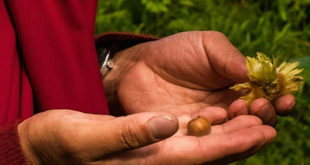 Bhutan shall adopt new irrigation and water efficient technologies. PDP will establish agricultural enterprises for products such as honey, egg, piggery, dairy and others in different parts of the country. Farm mechanization will be promoted. PDP shall promote private ownership of power tillers by subsidizing the cost and facilitate access to finance for agricultural enterprises through Priority Sector Lending (PSL), Rural Enterprise Development Corporation Limited (REDCL), microfinance programs and Bhutan Development Bank Limited (BDBL). PDP shall provide one more power tiller to every chiwog and ensure that every chiwog has a minimum of two power tillers. PDP shall encourage contract farming through Public Private Partnership (PPP) model. PDP shall enhance access to finance for agriculture related businesses through programs such as REDCL, PSL and BDBL. To encourage youth in agriculture, PDP shall facilitate access to finance through Priority Sector Lending (PSL). PDP shall promote organic agriculture and organic livestock farming through several strategies including developing Organic Guarantee and Certification System (OGCS). PDP shall continue to support Farmers’ Groups for production and marketing. It shall increase the export of Bhutanese agricultural produce and products by establishing market linkages abroad. It shall provide land on lease to encourage youth to take up agriculture. Such opportunities will also be extended to retired civil servants and retired armed force personnel who want to take up commercial farming. PDP shall reduce the incidences of forest fires through use of better technologies and intensifying advocacy. PDP shall provide timber subsidy to the rural population. Human-Wildlife Conflict will by addressed by upscaling use of electric fence and exploring modern technologies. PDP shall strengthen Crop Endowment Fund for Crop and Livestock Conservation and simplify the process for insurance claims for crop damage. Tourism will get an industry status to tourism sector to facilitate access to finances and business promotion. PDP shall open up all dzongkhags to tourism. PDP shall open the southern gateways to facilitate arrival and departure of tourists. PDP will create 5,000 new jobs in the tourism sector in the next five years. It shall develop and expand the Gelephu Domestic Airport infrastructure as an emergency landing airport to handle landing of Airbus aircrafts in situations when landing is not possible in Paro. This would be the first step towards expanding the Gelephu Airport into an international one. PDP shall buy additional helicopters to enhance domestic helicopter service and tourism. Every dzongkhag will be identified as a tourist destination for special product or services and it will be branded and marketed accordingly. PDP shall promote eastern, southern and central dzongkhags as attractive tourism destinations to diversify benefit from the tourism industry. Bhutan will be promoted as a unique destination for adventure sports. Linkages between tourism and other sectors like agriculture, handicraft, businesses and other creative industries will be promoted. PDP shall also promote domestic tourism by developing and advocating pilgrimage and spiritual tourism sites for Bhutanese. 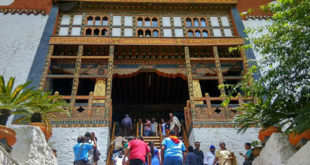 Bhutan will be promoted as a unique Meeting Incentive Convention and Events (MICE) tourism destination. PDP shall facilitate capacity enhancement of our tour guides through various training programs both within the country and abroad. PDP shall facilitate the establishment of training centers and tertiary institutes in the hospitality sector. PDP shall continue providing economic incentives to promote eco-tourism. PDP shall extend the incentives already enjoyed by high-end hotels to all tourist standard hotels. PDP shall facilitate and promote the handicrafts sector through various incentives. PDP shall facilitate access to finance for CSMI through Priority Sector Lending (PSL), REDCL, microfinances and BDBL financial products. PDP shall support startup initiatives through support services such as capacity building, access to finance, obtaining clearances and licenses and establishing linkages. PDP shall continue to enhance REDCL to provide finances for CSMI and non-formal rural economic activities at a low interest rate of 4% and without collateral. The REDCL shall be expanded and it will offer a separate program for the youth and a separate program for women. 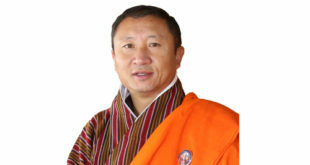 PDP shall develop and operationalize the four Industrial Parks of Bondeyma (Mongar), Dhamdum (Samtse), Jigmeling (Sarpang) and Motanga (Samdrup Jongkhar). PDP shall construct a dry port in Pasakha, Phuentsholing, and access road to the port. The detailed feasibility study of Gelephu Dry Port will be completed. PDP shall complete the ground works for Nganglam Dry Port and operationalize it. PDP shall invest in the maintenance of industrial parks in Pasakha, Phuentsholing and Bjemina, Thimphu. PDP shall develop a mini-industrial estate in every dzongkhag. PDP shall explore the possibilities of creating infrastructural linkages to or with railways network in India to boost export. PDP shall strengthen Better Business Council, the apex policy discussion forum between various stakeholders including the government, into a National Business Council. PDP shall establish regional and Dzongkhag Business Councils. PDP shall improve Bhutan’s World Bank Doing Business ranking to top 50 position in the world. PDP shall put in efforts to improve Bhutan’s global business competitiveness ranking to create enabling environment for business. PDP shall review regulations to address double taxation. PDP shall review legislations and rules and regulations that impact our businesses to remove bottlenecks and red tape. PDP shall streamline and fast track services by introducing One Roof Services. PDP shall encourage and promote businesses that focus on import substitution. PDP shall work with Local Governments to stimulate growth of rural economy. PDP shall explore urban and export markets to promote rural economy. 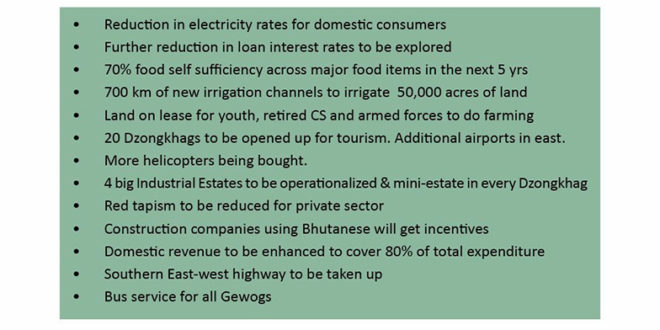 PDP shall initiate One- Gewog-One-Project and One-Dzongkhag-One-Project programs to boost local economy. PDP shall facilitate access to finances for businesses that promote local economy and jobs creation. PDP shall prioritize the integration of local enterprises and communities in the tourism industry. It shall promote rural economy, tourism, handicraft and other indigenous products. PDP shall create market linkages and product promotion for SMEs & CSIs. 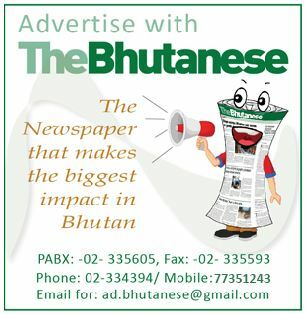 PDP shall upscale the Brand Bhutan Initiative. PDP shall incentivize businesses that promote exports. It shall ensure that the average growth of export in the next five years increases by 5% annually. PDP shall work towards 20% increase in export volume of 22 identified products having export potential. PDP shall increase value of export of manufactured products by more than Nu. 5 billion. PDP shall prioritize diversification of locally produced construction materials, thereby reducing import of raw materials. PDP shall promote professionalization, sustainable maintenance, and improvement of quality infrastructure and promotion of green and disaster resilient construction technologies. The Bhutan Schedule Rates (BSR), which is the basis for all the cost estimates in the construction industry, shall be reviewed and updated. PDP shall develop user-friendly guideline on Building Construction approval. PDP shall promote the use of relevant advanced technologies to promote mechanization in the construction sector. PDP shall promote employment creation in the construction industry by incentivizing construction companies that employ Bhutanese. PDP shall formulate debt management strategy and prepare periodic debt reports. PDP shall enhance domestic revenue to cover about 80% of the total expenditure. It shall explore and consider partnership under Public Private Partnership (PPP) modality with financial institutions like National Pension and Provident Fund (NPPF) to bridge the gap in infrastructure financing. PDP shall develop a robust and inclusive macroeconomic model to strengthen coordination, reporting and policy formulation. PDP shall promote e-procurement and e-auctioning systems. It shall promote e-payment initiatives. PDP shall revise the Procurement and Financial Manual. PDP shall review the Minimum Lending Rates (MLR) in close consultation with the central bank and explore all options to continue lowering the commercial lending rates of loans and credits. PDP shall study the remittance sector in Bhutan and work to facilitate and upgrade Remit Bhutan program of the central bank. PDP shall strengthen and upscale REDCL to empower small and value added businesses. PDP shall prioritize the Priority Sector Lending (PSL) to ensure that rural and agriculture based entrepreneurs have easy access to finance. It shall explore and implement seasonal loans for farmers to ensure that they get easy access to finance when they need it the most. PDP shall facilitate different modalities to ensure that access to loans is improved for the private sector. PDP shall establish an Economic Early Warning System to strengthen coordination, reporting and policy formulation. PDP shall make prudent efforts to forecast key economic indicators to determine growth trajectory and establish macroeconomic inter linkages between sectors to ensure forecast results are consistent with economic realities. PDP shall strengthen and develop Fiscal Framework as per international standards. PDP shall initiate and promote green and environment friendly procurement. PDP shall construct the Southern East-West Highway, Lhuentse-Trashiyangtse Highway, Shingkhar-Gorgan road, Lhamoizingkha-Sarpang Highway, Dewathang-Nganglam Highway and Samrang-Jomotshangkha road. PDP shall ensure all major farm roads have a minimum of a base course to make it all weather roads. PDP shall maintain all Gewog Center (GC) roads. PDP shall improve and maintain Northern East-West Highway and blacktop the Haa-Samtse Highway. The tunneling of Thimphu-Paro and Thimphu-Wangdue roads will be explored. PDP shall shorten Trashigang-Mongar highway from Sherichu to Gongrizomsa on Gyalposhing-Nganglam highway by about 30km. It shall come up with a comprehensive network of national highways connecting the entire nation. A minimum standard for national highways will be developed to ensure the most economical, safe, reliable and quality national highways in the country. We shall build restroom facilities along all major national highways. PDP shall introduce public bus services to all gewogs to increase connectivity. There will be government subsidies for non-profitable bus service routes. It shall expand and build new bus terminals and parking space for trucks and taxis in all dzongkhags. Wheel chair ramps will be built at bus terminals across the country. The possibilities of constructing additional domestic airports in eastern Bhutan will be explored. PDP shall upgrade and expand the Gelephu Domestic Airport infrastructure. Aerodromes will be built in Bumthang and Yonphula airports. PDP shall review and increase the loan equity for public transport buses, taxis and trucks from the current 30% to 70%. PDP shall enhance the load carrying capacity for trucks in view of the improved road conditions and in light of the fact that trucks these days are technically better and safer than in the past. PDP shall streamline red tapism in transit documentation required for truckers and vehicle transit agencies. It shall institute a dedicated office with a special contact number to take care of truckers, taxi drivers and travelers travelling in India in times of emergencies.